PHILADELPHIA, Pennsylvania -- The New York Mets clinched a playoff spot Saturday, beating the Philadelphia Phillies 5-3 to secure the top National League wild card. The defending NL champions will host San Francisco or St. Louis on Wednesday night at Citi Field, with the winner advancing to face the Chicago Cubs. James Loney hit a two-run homer to back 43-year-old Bartolo Colon (15-8), and Jeurys Familia closed for his major league-high 51st save. T.J. Rivera, Jose Reyes and Asdrubal Cabrera each had an RBI single. 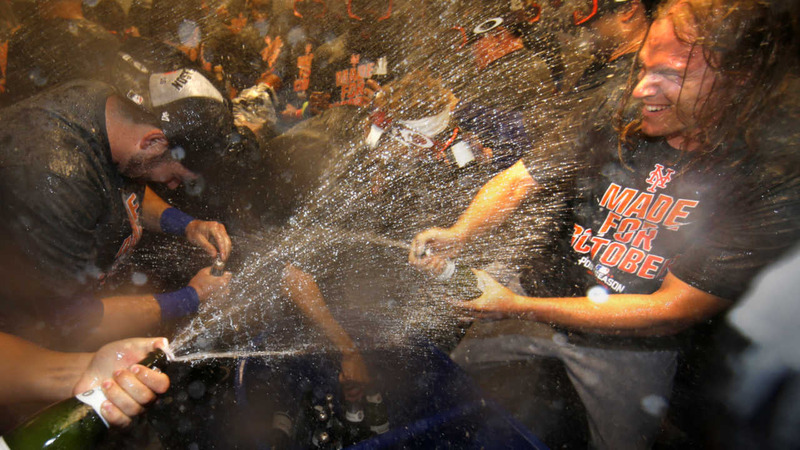 The only other time the Mets made the postseason in consecutive years was 1999-2000. New York won the NL East last season and went all the way to the World Series before losing to Kansas City. This season has presented all sorts of new challenges. The banged-up Mets (87-74) overcame a bevy of injuries that depleted their lineup and decimated a terrific young rotation - with Matt Harvey, Jacob deGrom and Steven Matz all sidelined by season-ending ailments. Two games under .500 on Aug. 19, the Mets have gone a major league-best 27-12 during the last six weeks to vault over four teams in the NL wild-card race. And by clinching with one day to spare in the regular season, manager Terry Collins and the Mets can save All-Star ace Noah Syndergaard for the wild-card game. The big right-hander could still get a brief tuneup Sunday against the Phillies, but should be fresh for Wednesday. When left fielder Michael Conforto made a sliding catch of Aaron Altherr's soft liner for the final out, the Mets streamed out of their dugout and gathered near the mound, bouncing in unison. Back in the clubhouse, they sprayed beer and champagne in a happy celebration. Ryan Howard hit a two-run homer in what was likely his penultimate game with the Phillies. Philadelphia's defeat was its sixth straight overall and 91st of the season. It's the club's second straight season with more than 90 losses. Howard brought fans out of their seats with a tying shot in the fifth inning. He turned on a 1-0 fastball from Colon, driving his 25th homer of the season into the right-field seats. At the urging of fans, Howard, who is expected to receive a $10 million buyout from the Phillies after the season, stepped to the top of the dugout steps and raised his right hand in appreciation. The Mets regained the lead in the next inning when Loney drove a 3-1 pitch from reliever David Hernandez into the right-field seats. Loney immediately turned to the Mets' dugout and raised both arms in triumph before flipping his bat and rounding the bases. He was mobbed by teammates when he returned to the bench. The Phillies drew within one when Darin Ruf hit a pinch-hit homer in the seventh, but Addison Reed and Familia closed it out with scoreless relief. Colon allowed two runs and five hits in five innings. Patrick Schuster (0-1) took the loss. Curtis Granderson had three hits and scored twice for New York. He is 12 for 23 in his last six games. Granderson scored in the fourth on a single by Rivera and again on Loney's homer. The Mets also manufactured a run in the fifth when Reyes followed a sacrifice bunt by Colon with an RBI single to score Travis d'Arnaud, who slid headfirst to beat a diving tag by catcher Cameron Rupp. The Mets went 3-3 against the Cardinals this season, and 4-3 against the Giants. Loney's homer was the Mets' 106th on the road this season, eclipsing their previous record of 105 set in 2000. New York's bullpen had its scoreless streak snapped at 23 2/3 innings when Fernando Salas allowed Ruf's homer. Conversely, the Phillies' relievers have given up 62 earned runs in their last 14 games (58 1/3 innings). Howard's home run was his 382nd for the Phillies and tied him with Jim Rice and Frank Howard for 67th place on baseball's career list. Phillies shortstop Freddy Galvis, who left Friday night's game in the seventh inning with tightness in his left hamstring, did not play. He was replaced in the lineup by Andres Blanco. The regular season ends Sunday, with Syndergaard (14-9, 2.60 ERA) scheduled to face Phillies RHP Jerad Eickhoff (11-14, 3.72).